We are excited to announce that Azure Advisor, Monitor, and resource health are generally available to you today, providing you with robust monitoring & alerting capabilities, and customized recommendations based on best practices. Your feedback during the preview release helped us prioritize the right set of capabilities that are now generally available. We have been using these services internally for quite some time to run and monitor Azure at scale, and starting today, you can leverage them to monitor, receive alerts and notifications when your Azure resources aren’t performing according to your plan. Furthermore, they provide recommendations when resources can be optimized. All this can be done via the Azure portal and/or programmatically via APIs. If you are running your virtual machines on Azure or using other Azure services, you can benefit from these capabilities today. You can, for example, access a wide range of metrics for your VMs with Azure Monitor, create alerts and get deeper insights with Log Analytics. If your VMs are underutilized, Azure Advisor will provide recommendations that can save you money. Let’s take a look at each of these in more detail. 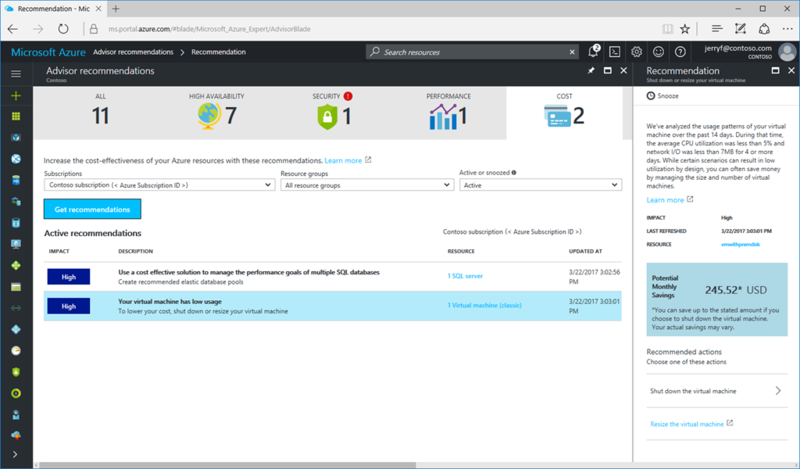 Azure Advisor provides personalized recommendations, and guides you through the best practices to optimize your Azure resources. By analyzing your resource configuration and usage, Azure Advisor provides guidance that helps you to improve the availability, security, performance, and cost effectiveness of your Azure resources. Visit the Advisor webpage and if you’re already an Azure customer take a look at your Advisor recommendations right now. Azure Monitor is the built-in platform monitoring service that provides a single pipeline for monitoring and diagnostics data across all Azure resource types, enabling you to easily monitor, diagnose, alert, and notify of problems in your cloud infrastructure. It provides platform metrics with one minute granularity by default. Azure Monitor now includes improved alerting and notifications such as SMS, email, and webhook. While Azure Monitor provides platform-level telemetry, you can gain deeper visibility into application telemetry and operational insights from Azure Application Insights and Azure Log Analytics respectively. Collectively these services help you unlock a comprehensive monitoring and management experience across your platform, apps, and workloads, all within the Azure portal. To learn more about Azure Monitor, read the blog post and visit the Azure Monitor webpage. Azure resource health helps you diagnose and get support when an Azure issue impacts your resources. It informs you about the current and past health status of your resources and helps you mitigate issues. Resource health provides technical support when you need help with Azure service issues. To learn more about resource health, explore the documentation and if you’re an existing Azure customer review resource health page in your Azure portal. All of these new capabilities are available today without needing to install any additional agents or configuration. As mentioned, many customers are already experiencing the combined power of these Azure services going into general availability today. For instance, “Azure Log Analytics and Azure Monitor offer very strong capabilities out of the box, and the extensible nature of these services allowed us to very quickly develop our production monitoring offering,” says Dugan Sheehan, Principal Product Architect - Azure Cloud at Rackspace. “Leveraging these services allows Rackspace the time to focus on other unique and leading customer centric support features and drive significant value to our customers”. We’re proud to launch these new capabilities and it’s great to hear the feedback and excitement from you too. Log-in to the Azure portal now and let us know how you like it.